Our 10-acre Pelican Wetlands is home to American white pelicans, most of which are rehabilitated, non-releasable birds due to wing injuries restricting their flight. Other native wildlife, such as turtles and frogs, also inhabit the area. Some of the pelicans arrived from Jackson Zoo, the holding institute for the birds affected by the recent oil spill and were deemed non-releasable by the U.S. Fish & Wildlife Service. 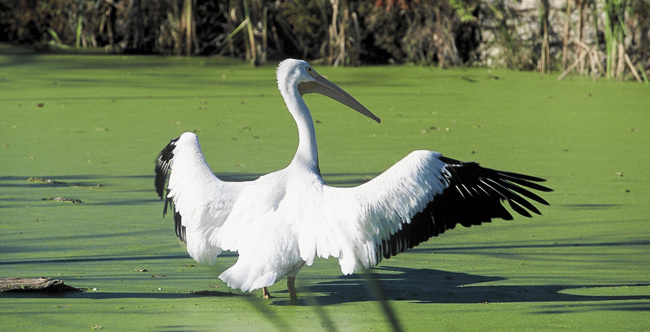 Pelicans are colonial breeders, meaning they only breed if living in large numbers. They also like to nest near water and can be found in the wild on lakeshores, estuaries or bays. Wetlands are of vital importance to most living organisms, and serve as a perfect feeding, resting and breeding ground for most aquatic birds. These areas only represent six percent of the Earth’s total landmass. American white pelicans are currently listed as Least Concern, according to the International Union for Conservation of Nature's Red List of Threatened Species. Fun Fact: A pelican’s wings span nine feet and their fleshy bill pouch can hold three gallons of water.